The end of 2016 marks the surprising return of the Portugieser Rattrapante in -for now- three different iterations. This watch, reference 3712, had been absent from the collection for some 10 years. 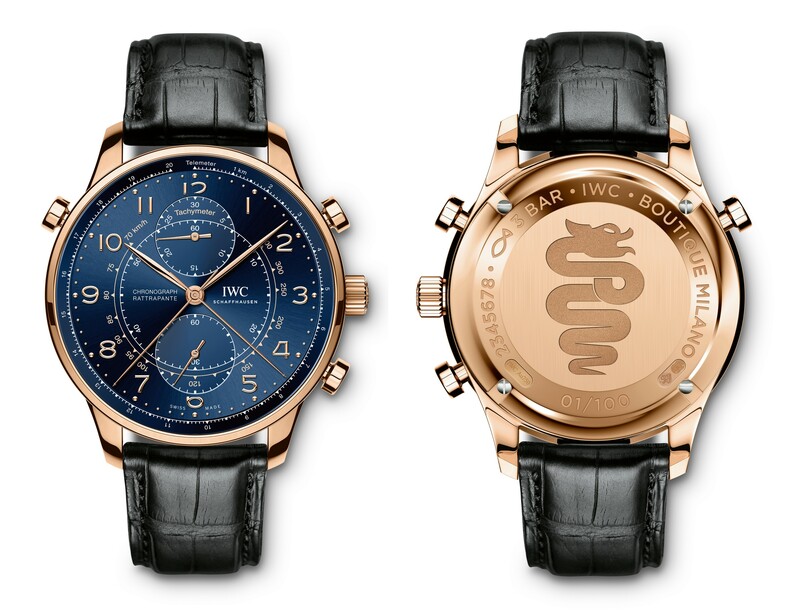 – The IW3712-15, a limited edition of 100 units in red gold, was created in honor of the Milan boutique. 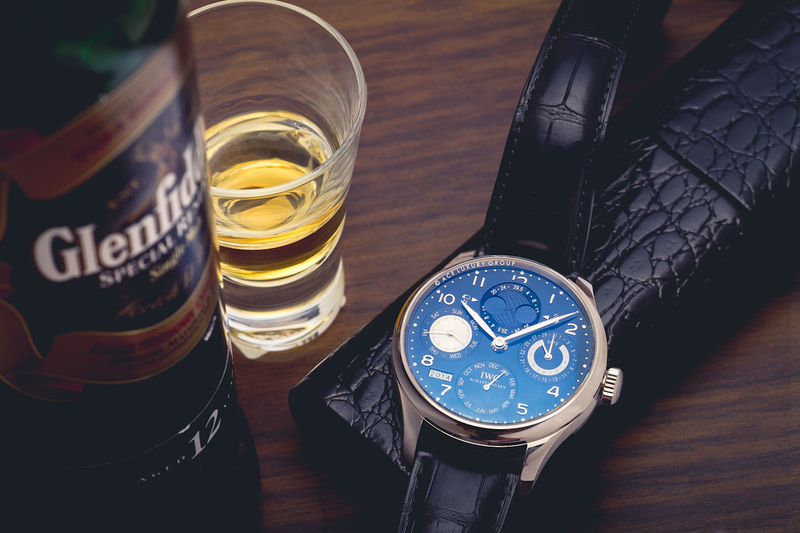 It features a blue dial with both a tachymeter and telemeter scale. – The IW3712-16, a limited edition of 200 units in stainless steel, was created in honor of the Paris boutique. It features a grey / black dial. – The IW3712-17, a limited edition of 200 units in stainless steel, was created in honor of the Munich boutique. It features a blue dial. While at the time of writing this little update the -15 and -17 were already launched, details on the -16 are still a bit sketchy. I will update ASAP. Add to this the new 3714-88 Bücherer and 3714-89 Seddiqi, and 2016 makes for quite a year for fans of the timeless Valjoux-based Portugiesers. Now how about a new 3705? This afternoon IWC surprised many with the introduction of the IWC Portugieser Chrono-Rattrapante IW371215 ‘Milano Boutique’, a limited edition of 100 pieces in honor of the Milan IWC Boutique. The introduction of the Portugieser Chrono-Rattrapante IW371215 marks the return of the 76240 movement, a hand-wound version of IWC’s famous split-seconds movement – it had been last used in the 2006 ‘Italia’ limited edition IW3712-14. The dial, featuring both a tachymeter as well as a telemeter scale, is inspired by the 2004 Barozzi IW3712-12 limited edition, which featured a similar design, though with the addition of the retailers logo. The Portugieser Chrono-Rattrapante IW371215 features a closed case back engraved with 01/100 and the Milanese ‘Biscione‘. More details in our database. 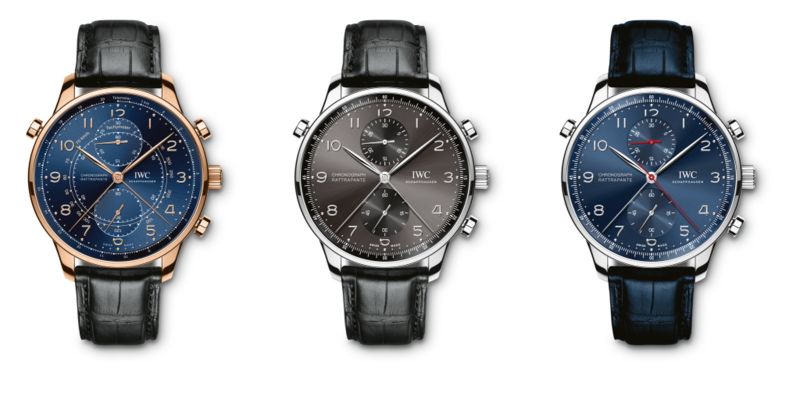 IWC introduces its second collaboration with Boesch: the IWC Portuguese Yacht Club Chronograph Boesch. The sumptuous mahogany body of the Boesch 620 Rimini served as the main inspiration. IWC first collaborated with Busch in 2009, when it introduced the Aquatimer Chronograph Busch in celebration of the 80th birthday of the boat builder. Now the two Swiss companies have once again put their heads together, leading to the Portuguese Yacht Club Chronograph Boesch IW390504. The IWC Portuguese Yacht Club Chronograph Boesch is a limited edition of 150 pieces. It is said to be inspired by the Boesch 620 Bimini, which explains the rich brown tone of the dial and the -real- mahogany inlaid in its case back. As all other IW3905 models, the case measures 43.5mm across, housing the self-winding caliber 89361 chronograph movement. More info in our database! 2003: Introduction of the first Portuguese Perpetual Calendar ref. 5021 with 44.2mm case and signature double moonphase indicator. 2006: Introduction of the Portuguese Perpetual Calendar ref. 5022 with 42.3mm case and traditional single moonphase indicator, to be sold alongside the 5021. 2010: Portuguese Perpetual Calendar ref. 5022 discontinued in favor of the 5023 with 44.2mm case. 2015: Portuguese Perpetual Calendar ref. 5021 discontinued in favor of the 5034. 2015: Portuguese Perpetual Calendar ref. 5023 discontinued in favor of the 5033. As is more often the case with IWC, numerous smaller updates on the movements and other parts have been performed throughout the production span of the various references. The fact that not all of them resulted in a different reference number is making our job somewhat hard. Perhaps in a future article we’ll go into depth on the smaller changes and the limited edition models. 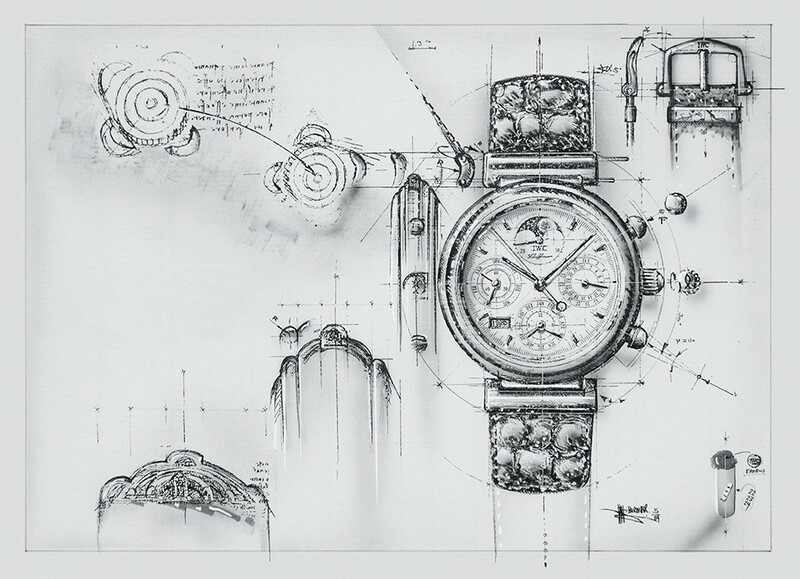 IWC introduced its perpetual calendar mechanism for wristwatches in 1985 in the Da Vinci reference 3570. It was a spectacular novelty at the time. With the Swiss watch industry only slowly recovering from the quartz crisis that had hit them hard in the decade before, the only companies of name offering haute complications like this were the of likes of Patek Philippe, Audemars Piguet and Vacheron Constantin – the three classic horological giants. To put things in perspective, the latter only introduced its first perpetual calendar watch since the 50’s in 1983. It is safe to say that the price of a watch with such a complication was at this time without exception high – very high. But then IWC came in. Some 10 years earlier, in the mid seventies, one of its watchmakers had in his spare time devised and created a simple calendar mechanism to be fitted atop a pocket watch movement. When finished, the IWC management was both impressed and interested by what this kind sir had achieved and decided to make it commercially available. Said gentleman, Mr. Kurt Klaus, was to be responsible for not only the design he submitted, but also for the prototyping and the production. Demand for pocket watches however rapidly shrunk, until there was virtually no market for them left at the end of the Seventies. It is said a no more than perhaps a few hundred examples left the factory. With their sights now set on wristwatches, IWC management asked Mr. Klaus to once again create a calendar mechanism. Mr. Klaus had of course gained a load of experience with the design, prototyping and producting of movements, as with the pocket watch caliber he had done most -if not all- of this by himself. He thus now felt confident that he could take this project one step further and create not just a simple calendar, but rather a Quantième Perpétuel – the elusive perpetual calendar. As was the case with the calendar pocket watch, this mechanism was to be build atop an existing movement. Mr. Klaus started this new project by thoroughly researching various movements made by competitors. One thing he noticed was the abundance of pushers needed to properly set the calendar – something he was not too fond of. So when he went to design his own mechanism, he decided to make it easy to operate: all adjustments would be performed with nothing but the winding crown. While the initial idea was to build it atop an automatic movement by Jaeger-LeCoultre, the visionary Günther Blümheim kindly suggested to design it with a chronograph movement serving as the base caliber, resulting in an even more spectacular and jaw-dropping final product. Subsequently Mr. Klaus worked in solitude for close to four years -no computers, no CAD mind you!- before the project was finally completed in 1985 and the Da Vinci 3570 was presented to the world at the BaselWorld show. Critically acclaimed and powered by its price that shook the industry, the module would grow out to be the most widely sold perpetual calendar mechanism – not only fitted to the Da Vinci collection, but in adapted form in the Novecento, the GST, the Pilot’s Chronograph and various models by JLC, including the current Master Ultra Thin Perpetual . It would also serve as the base for the IWC’s Grande Complication and their masterpiece of the time, the spectacular Destriero Scafusia. Fast forward 10 years. After a limited edition run two years earlier, IWC introduced the Portuguese back into the regular collection in 1995 with the Chronograph Rattrapante and Chronograph Automatic. Inspired by the success of this collection, IWC decided to create a new model powered by a movement matching the generous proportions of the case: an automatic movement with the size of a pocket watch movement. First used in the Portuguese 2000, the movement used IWC’s signature Pellaton winding system and boasted a 8 day power reserve – restricted to 7 days to ensure accuracy throughout the range. When this movement was adapted for the Big Pilot, a date feature was added, which gave Kurt Klaus -now with a proper team by his side- way to adapt the Da Vinci perpetual calendar mechanism to this new movement. It was after all the date mechanism with its 24h wheel and rapid change that both inspired and served as the base of the first module. This resulted in the first Portuguese Perpetual Calendar, ref. 5021, in 2003. Aside from the dimensions the mechanism was almost identical, with one notable exception: there now was room for more teeth on one of the moonphase gears, enhancing the accuracy of the display from one day off in 122 days for the Da Vinci to one day off in 577 years for the Portuguese and other models based on the same movement, like the Big Pilot Perpetual Calendar. The dimensions however caused more intermediate gears to be needed, increasing the parts count for the calendar module from 82 to 109. In 2006, the original Portuguese Perpetual Calendar was accompanied by the slightly smaller 5022. While the former had a case of 44.2mm and sported the signature double moonphase display, the latter had a slightly smaller case (42.3mm) and a single moonphase. One might say that the newer 5022 was more of a traditionalists choice. The 5022 however would not be long lived: it was replaced in favor of the 44.2mm 5023 in 2010. In 2015, IWC celebrated the 75th Anniversary of the Portuguese with the introduction of a myriad of new models and revamps of most of the existing ones. Both the 5021 and 5023 were phased out in favor of the 5034 and 5033 respectively. Besides a number of changes on the design, the movement powering this new generation of Portuguese Perpetual Calendars was now fitted with twin barrels ensuring the 7 day power reserve, while the previous generations got their power from one single barrel.